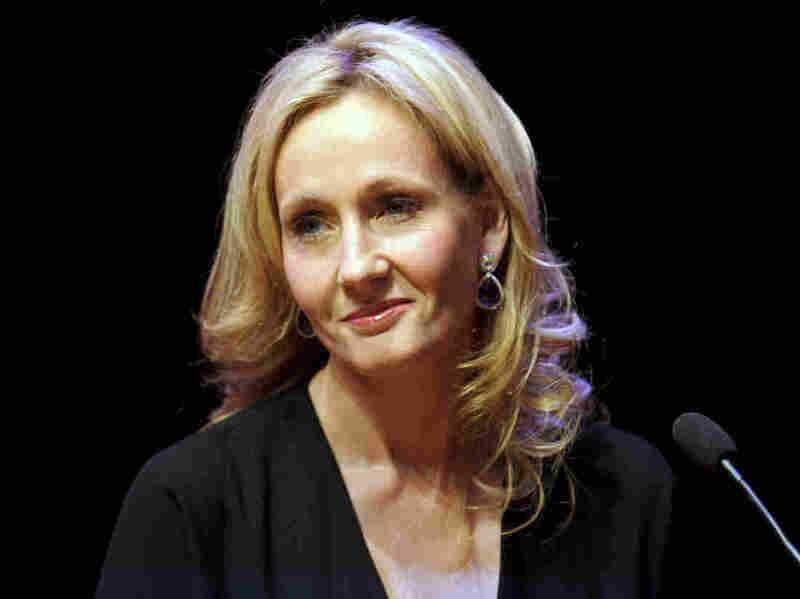 Book News: J.K. Rowling Tells 'Harry Potter' Backstories : The Two-Way Quidditch was invented "in a small hotel in Manchester after a row with my then boyfriend," writes the Harry Potter creator. Other book news: Ireland puts an entire short story on a postage stamp; Daniel Handler on Midwestern literature; and the best books coming out this week. J.K. Rowling, Seamus Heaney, Hilary Mantel, Tom Stoppard and Ian McEwan, together with dozens of other well-known authors, have annotated first editions of their novels for an auction on Tuesday to benefit English PEN, an organization that promotes freedom of expression. An interactive project at The Guardian lets you scroll through the annotations online. Among other revelations, the notes on a first edition of Rowling's Harry Potter and the Philosopher's Stone show that the original Hufflepuff mascot was a bear, not a badger, and that Quidditch was invented "in a small hotel in Manchester after a row with my then boyfriend." Also charming are Seamus Heaney's notes on Death of a Naturalist — he wrote on his poem At A Potato Digging that "[Poet] Anthony Thwaite once described me (to my face) as 'laureate of the root vegetable.' "
A new postage stamp in Ireland has an entire short story printed on its surface. Written by an Irish teenager, the 224-word story is an ode to Dublin. Here's an excerpt: "Now, where Norsemen once stood, I look back, along the quays, streets and alleys, to where the inhabitants live their lives: eating, speaking, and breathing their city into existence." In a review of Tom Drury's Pacific for The New York Times, Daniel Handler (aka Lemony Snicket) explains, with his characteristic bluntness, the problem with talking about "Midwestern" literature: "Calling a writer 'Midwestern' seems like a way to start up that familiar and imaginary battle between Plain Novels Full of People With Integrity and Dirty Fingernails versus Showoffy Books About People Having Martinis in Penthouses." Critic and author Greil Marcus argued that the distinctions between "high" and "low" culture are artificial in a commencement address at New York City's School of Visual Arts: "I've always believed that the divisions between high art and low art, between high culture, which really ought to be called 'sanctified culture,' and what's sometimes called popular culture, but really ought to be called 'everyday culture' — the culture of anyone's everyday life, the music I listen to, the movies you see, the advertisements that infuriate us and that sometimes we find so thrilling, so moving — I've always believed that these divisions are false." J.R.R. Tolkien's The Fall of Arthur, an incomplete epic poem on King Arthur, has been edited for publication by his son, Christopher Tolkien, and newly released. Erudite and beautiful, it's written in Old English alliterative verse (the meter of Beowulf!). It begins: "Arthur eastward in arms purposed/ his war to wage on the wild marches, / over seas sailing to Saxon lands, / from the Roman realm ruin defending." NoViolet Bulawayo's We Need New Names is the story of Darling, a young girl who flees to the U.S. from the strife and corruption of President Robert Mugabe's Zimbabwe. But, interestingly, We Need New Names is nearly as incisive about the American immigrant experience as it is about the failings of Mugabe's regime. The Unwinding: An Inner History of the New America, from The New Yorker's George Packer, argues that basic American institutions – farms, schools, factories — are collapsing. On Weekend Edition Sunday, he told NPR's Rachel Martin that "it feels like a real cultural shift where the value of the community, of what makes this a coherent society has really been submerged." He illustrates his point with fascinating profiles of Americans from Oprah Winfrey to a North Carolina tobacco farmer to former House Speaker Newt Gingrich, R-Ga.